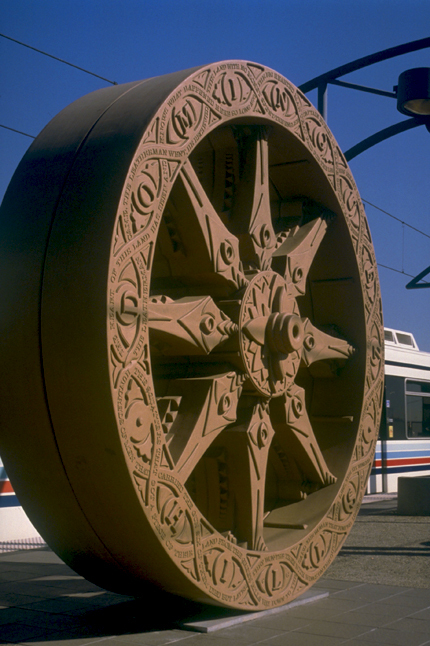 Colin Gray created a decorative cast-stone cartwheel of approximately nine feet in diameter which is placed upright in the center of the station platform. Partially inspired by the ornate wheels on the facades of the temple in Konarak, India, this wheel has both visual and verbal riddles as part of the design. These riddles are made from images and events gleaned from local history, provoking commuters to solve them over the days and years of their traveling. "On visiting the site, it struck me how everything as far as the eye could see was industrially made, practical and plain. Rather than blend in, I set out to produce something in direct contrast, thinking that more industria-looking objects or processes, more plain formed surfaces and more reminders of the pragmatic life would not necessarily be a gift to the community. The idea of the ornate wheel was born out of the desire to balance what is there with something handmade rather than industrially made, ornate rather than plain, ceremonial rather than practical, and still rather than moving." COLIN GRAY, born in England, has made California his home since 1981. He has shown his work abroad and in many major cities in the U.S. including solo shows in New York, San Francisco, and Los Angeles. His work over the last 20 years has often utilized and transformed practical everyday objects—shovels, saws, wheels—into sculpture, drawing, and installation. As a child he once saw a wavy blade ceremonial dagger in the Tower of London. This singular event, he feels, was the beginning of his work: to attempt to reveal something infinite by transforming the finite.